3) Angélico, Garza Jr., Jack Evans vs Hijo del Fantasma, Joe Lider, Pentagón Jr.
Garza Jr was originally listed only as a surprise wrestler. Match added to the card on October 16th. Fenix, Psycho Clown and Texano Jr. had previously been booked in the main event, Zorro. Taurus and Electroshock were added to the card. Cage & Alberto added to the card on 2015-10-16, with Myzteziz being removed. Promocions Cantu released a new lineup. 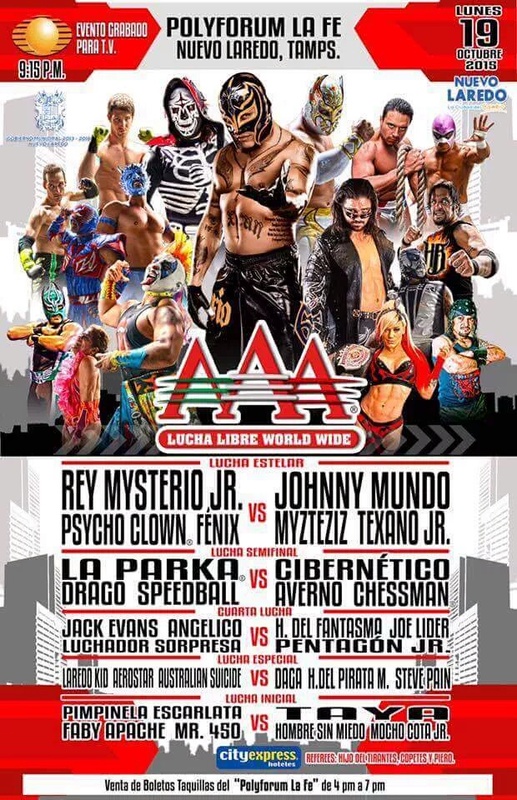 Not exactly a new poster – Myzteziz is hanging there in the background – but AAA is doing a nice job of making up for pushing back the date and losing one of the top guys: El Patron Alberto, Brian Cage, Zorro, Taurus and Electroshock are all being added. People who wanted to see Myzteziz will probably be very okay with the replacements. (Garza Jr. was also revealed to be the mystery tecnico in the tercera.) This might be the exact line that happens on the 2nd – Mr. 450 is probably not in Mexico for that long – but it’s good they’re even updating lineups. That should be a standard thing to do, but it’s not so it’s got to be appreciated when it’s actually done. Adding a match seems to make this a two week taping (airing on TV November 7th and November 14th) and bumps back Xalapa (November 21st) and Ciudad Juarez (November 28th). That leaves the December 5th, 12th and 19th TV shows left open (with Best Of probably starting the following week.) Two of those weeks are Guerra de Titanes, so maybe just one more regular TV taping left to announce for this year, unless they’re going to carry extra TV into 2016. Otherwise, this should be a good card. New main event is interesting – if Mundo and Alberto are now matched up, does that mean we’re getting Brian Cage versus Rey Misterio Jr.? That’s intriguing. 3) ?, Angélico, Jack Evans vs Hijo del Fantasma, Joe Lider, Pentagón Jr.
5) Fénix, Psycho Clown, Rey Misterio Jr. vs Johnny Mundo, Myzteziz, Texano Jr.
Air Date: 10/31 or 11/07. Thinking more the first. Remains weird the tapings for after Heroes Inmortales have leaked out and not for the show itself. Maybe they’ll holding it until after tonight’s Cancun taping. Same roster as Reynosa, same basic matches with a few people moved around and a different set of locals. Laredo Kid will be in a fantastic match, that’s pretty cool. Speedball is getting brought all the way to Mexico for a match with La Parka and the Hell Brothers, that seems a waste. (Even though it’d be a demotion for the new guy, I’d rather see Pimpi in that spot and Speedball int he opener.) Weird the Reynosa show has two mystery person and this one only has one – whoever is coming in as the rudo isn’t sticking around for both shows. I understand the travel limitations mean these these cards can’t have a variety of people but, if these double tapings are going to keep on happening, it’d be nice if there were something besides slightly different meaningless trios matches on back to back weeks of TV. The television product would be better if it felt like there were meaningful matches going on. Taya’s on both these shows, Taya’s had zero televised defenses in her year plus as champion, why not just have a Taya title defense against Faby on one of these shows? (There might be a problem getting a good finish, but AAA never has a probably doing a bad finish.) I’d assume the tag team title match is being saved for a reason, but they could do Psycho Clown versus any one on the rudo side in the same way. Good TV needs some special hook to happen one every show, and this is more the CMLL-like way of making boring TV then the Lucha Underground way of making something people have to check out each week. This may be uneventful TV, but every match – except that semimain – has a chance of being very good and I’m interested in seeing it. Weirdly, the cycle of TV leading up to TripleMania appears to be the most boring section of TV this year. The TV prior was better, the TV leading to Heroes Inmortales looks good, and these shows leading to Guerra de Titanes will at least have some good matches. No idea of when the next taping is, because this is far into the future. There should be 2 or 3 more tapings after this until Guerra de Titanes. The end of the year is already on the horizon. All Elite/Elite Lucha Libre held a press conference today to announce their plans. As usual, even though they’re officially an independent promotion, it was held in Arena Mexico in front of a CMLL background. Myzteziz revealed his new name will be Místic 2.0. He said he had no contract (or was out of contract) with AAA and just decided he was going to leave. He had nice things to say about Rey Misterio Jr. He said he believed he had the rights to the Myzteziz mask, and his new look would combine elements of all his previous characters but he’d be getting rid of the horns. The promotion announced they would be running regularly on Sundays starting November 8th. Myzteziz claimed his brothers (Argenis, Argos and Mini Murder Clown) had not left AAA, each family member was making their own decision, and he had not tried to recruit anyone to come with him. The name’s not good – adding 2.0 is only good for making jokes hoping for an upgrade to 2.1 next time he botches something – but we got used tot he last name. The running shows every Sunday is really interesting. In a way, they’re already running shows every Sunday: they’re running next Sunday in Arena Mexico and the following Sunday in Guadalajara. There was no mention of where they’re running the 11/08 show. If it’s in Arena Mexico, that’s a pretty big deal in terms of how CMLL works. If it’s not in Arena Mexico but in Mexico City, the relationship between Elite and CMLL probably won’t end up well. If it’s just touring around the country every Sunday, that’s not as interesting but will probably keep him busy longer. These shows are being built completely around Myzteziz, and he’ll be the #1 guy. Edit: Apolo Valdes says Elite will be taking over the Sunday Arena Mexico shows starting 11/08. That’s a big deal for CMLL to give up one of it’s weekly spots. It’s almost as if Elite is second brand for CMLL. If Mistic 2.0 was really not under contract, that changes the whole look of the jump – Myzteziz is still a bit unprofessional, but AAA probably should’ve locked down the guy they were building around. AAA’s in the past been pretty insistent that all their top guys are signed to contracts. Furia de Titanes also disputes the story that Myzteziz was trying to recruit people to leave AAA to CMLL with him, saying a luchador couldn’t possibly guarantee someone spots in another promotion. They also say Argenis and Argos haven’t left AAA at this time, and Argos was only off TV because a “cuban” took him off. This is meant as a slam on Konnan, but if Konnan took the largely terrible Argos off TV in favor of better people, this is actually a great compliment. Please Argos/Argenis leaving started because Argenis changed his Facebook page to take AAA out of the name. (Argos too.) Electroshock figured out that all he had to do is pro-AAA picture and everyone would figure out everything is OK now. Argenis has not. The last time these two met was on this year’s FantasticaMania. (CMLL’s preview forgot, but so did I until I looked this up.) Ultimo Guerrero won that won, won the last one in Arena Mexico during 2014 Dia de Muertes, and is the heavy favorite to win tonight. This is a not a great matchup for people who watch everything. Atlantis & Ultimo Guerero have the same match every time and they’ll be having it here. It’s a better match for those who don’t follow the promotion so closely or just aren’t as cynically numb. Atlantis doesn’t really need the win (but is one of the few top guys who hasn’t won this tournament) and Ultimo Guerrero doesn’t need to be a three time champ either. The better match will likely be the Demus 3:16/Shockercito hair match. This is a rematch of a 2009 match, where Shockercito took then Pequeno Damian 666’s hair. Shockercito has never lost his hair and Demus has only lost his hair once since that (versus Virus in the match that sent him back to the minis division, when they were just adding more and more stips.) Both Demus & Shockercito have been pretty great of last and have some signature spots that everyone loves. Shockercito probably will win again, but it’ll be a fun match to that ending. The other matches on the show include Los Ingobernables (Rush, Sombra, Marco) versus Volador, Valiente, Maximo and Stuka, Dragon Lee and Guerrero Maya versus Virus, Boby Zaval and Kamaitachi. Both of those could be quite good. The show will air on ClaroSports.com at 8:30pm. There were no issues last week, hopefully they keep that streak. WWE is in Merida as show 1 of their three show tour. The scheduled main event is Undertaker & Kane versus Luke Harper & Braun Stroman, though WWE shows frequently change. This is Undertaker’s first appearance in Mexico since 2010 and probably his last shows in this country. They’ll be in Mexico City on Saturday and Monterrey on Sunday. King Barrett & Charlotte did press yesterday. Averno’s first post-Mytzeziz jump match was Sunday in Oaxaca, and Mano a Mano notes he participated in his match as normal. That match was supposed to be the main event but instead was the tercera, with Alberto explaining it had to occur earlier because he had to leave immediately afterwards due to personal issues. Hope everything’s OK.
Alberto was in Aguascalientes last night, teaming with Hijo de Rey Misterio (III) versus Dr. Wagner and Laredo Kid (replacing Extreme Tiger.) It’s tough to tell on the fan cam, but it looks like a good crowd. Rey Misterio was being advertised as appearing for a promotion in France next weekend. Today, the group announced Rey Misterio will not be appearing in France, because he demanded first class tickets for himself and his wife. The promotion says they were willing to give his wife a ticket, but balked at the (huge) price of first class upgrade, and now they’ll never be seeing the advance again. They’ve posted photos of payments on their Facebook. This story sounds a lot like the Alberto/wXw story, though this promotion (LNC) seems far less well known. The flights list Rey going to France from the 19th to the 29th. Rey’s booked in Torreon on the 18th, so that would be tough to get him back to San Diego for that first flight. Maybe he was doing that because his wife was coming along, but strange they would have him go all the way back to San Diego instead of flying to France out of Mexico City or Monterrey or some place like that. On the other hand, Rey going to France and being unavailable to work AAA TV would easily explain why the Nuevo Laredo taping got pushed back a few weeks. Lestat acknowledged his mask match with Molotov wasn’t good and pointed the blame at Molotov. Molotov, maybe doing kayfabe to explain why he lost, said he hurt a ligament a week ago. Not sure what ligament. Molotov pointed out Lestat should’ve been DQed for unmasking him, but he was a professional and kept on going. Lestat made the case that the Puebla luchadors have turned the tide against the Mexico City ones, with Stigma, Espiritu Maligno and Lestat getting big wins. Frontera NorteSure writes about the lucha libre scene in Ciudad Juarez. Eduardo Macazani, who founded local magazine La Lucha Juarez, guessed there’s 300-400 luchadors active in the area and 10 different active arenas. Kris finds so many posters from Juarez and El Paso and those numbers seem about right.Lucha World has KrisZ’s news update. CaraLucha has an interview with Espanto Jr. for Saturday’s show, who’s making the case that he’ll show more in this match than in his emergency fill in duty on the last show. RobViper has highlights of 04/30/15 AAA. Segunda Caida reviews Blue Panther vs Virus. The Sporting Nation writes about the POR promotion in Glendale, Arionza. LA Park claims he gets paid better in Arena Naucalpan and Arena Lopez Mateos than he did in Arena Mexico. Plantilla Deportiva has a video interview with Taya. Ian posted this week’s AAA show with English commentary. Mexico city indy promotion IWG held a press conference for their 10/31 show, their first in over a year. They announced a partnership with RCW Evolution in Europe. Alas de Angel lost his mask to Angel Real in San Luis Potosi. Pirata Morgan and Blue Demon Jr. want to start feuding. What was good? Everything! Three matches, all good. The Aerostar/Bengala/Argenis vs Daga/Pirata/Pain match was as great a trios match as AAA’s had all year.